The overall feel of the house is that of a summer cottage—fresh and cheerful—a homey place—one to return to over and over. The century-old structure has undergone a metamorphosis—an ongoing project. Returning guests look forward to seeing the changes that have occurred over the just-past winter. Fourteen bedrooms — each decorated in a different theme sleep from two to four people. The house comfortably accommodates 34 people. All rooms have air conditioning. Some rooms have private baths — others common baths. Five common baths are available. A breakfast room/gathering room seats 30+ for breakfast or meetings. Guests can relax in the TV/sitting area. After breakfast, guests can use the tables for games and light meals. An upstairs screened-in porch has two sleeping rooms on each side of a wicker-furnished sitting area. Guests who reserve both rooms have the option (extra charge) of having the porch for their private use. 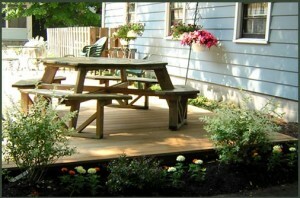 The back deck is an inviting spot at the Idlewyld B&B. In a large saucepan or Dutch oven, brown beef; drain. Add remaining ingredients; bring to a boil. Reduce heat; cover and simmer for 30-40 minutes or until peppers are tender. This is a very old family recipe for the best Peach Cobbler I have ever tasted. I use it as a breakfast dish because of the low sugar content–I let the sweetness of the peaches do the job–which my guests appreciate. Note: You can also bake the batter only to make a great shortcake. Beat eggs until light; add sugar, melted butter, milk. Sift flour, baking powder and salt into egg mixture. Mix thoroughly. Butter a 9×13 baking pan and fill with pared and sliced peaches. Mix 2/3 cup sugar with 1 teaspoon cinnamon. Sprinkle over peaches. This recipe goes a long way back to my days at a girls boarding school in Ohio. In those days, home economics was a requirement. Since we all took turns doing the cooking and baking for the other students, we had to made it good, or we had a lot of people really mad at us. I remember my roommate making this terse entry in her diary — “Tiz burned the carrots.” I guess that was the beginning of my training to be a B&B hostess. This “pudding” is the delicious treat we all looked forward to at Thanksgiving and Christmas. Although, called “pudding,” it is very thick and chewy. Idlewyld is located in a summer resort community. On rainy days, I often have impromptu tea parties for our house-bound guests and this might be one of my selections.